The concentration of the various electrolytes in body fluids is maintained within a narrow range. However, the optimal concentrations differ in the extracellular fluid and intracellular fluid. For example, the concentration of sodium in extracellular fluid (serum) is about 15 times higher than in the intracellular fluid. Conversely, the concentration of potassium is about 30 times higher within the cell than in the serum or extracellular fluid. Stability of the electrolyte balance depends on adequate intake of water and the electrolytes, and on homeostatic mechanisms within the body that regulate the absorption, distribution, and excretion of water and its dissolved particles. Many conditions can interfere with these processes and result in an imbalance. For example, renal disease, in which the kidney nephron is unable to function normally, causes a retention of water, sodium, chloride, bicarbonate, and calcium as the glomerular filtration rate falls. Even when the kidney structures are intact, electrolyte imbalances can result from an inadequate supply of blood to the nephrons or from imbalances of regulatory hormones such as aldosterone and antidiuretic hormone. The effects of an electrolyte imbalance are not isolated to a particular organ or system. In general, however, imbalances in calcium concentrations affect the bones, kidney, and gastrointestinal tract. Calcium also influences the permeability of cell membranes and thereby regulates neuromuscular activity. Sodium affects the osmolality of blood and therefore influences blood volume and pressure and the retention or loss of interstitial fluid. Potassium affects muscular activities, notably those of the heart, intestines, and respiratory tract, and also affects neural stimulation of the skeletal muscles. Assessment and nursing interventions related to electrolyte imbalance are shown in the accompanying table. Electrolyte composition of body fluid. 1. Any compound that, in solution or in molten form, conducts electricity and is decomposed (electrolyzed) by it. 2. An ionizable substance in solution. /elec·tro·lyte/ (e-lek´tro-līt) a substance that dissociates into ions when fused or in solution, thus becoming capable of conducting electricity. amphoteric electrolyte ampholyte; a compound containing at least one group that can act as a base and at least one that can act as an acid. an element or compound that, when melted or dissolved in water or another solvent, dissociates into ions and is able to conduct an electric current. Electrolytes differ in their concentrations in blood plasma, interstitial fluid, and cell fluid and affect the movement of substances between those compartments. Proper quantities of principal electrolytes and balance among them are critical to normal metabolism and function. For example, calcium (Ca++) is necessary for relaxation of skeletal muscle and contraction of cardiac muscle; potassium (K+) is required for contraction of skeletal muscle and relaxation of cardiac muscle. Sodium (Na+) is essential in maintaining fluid balance. Certain diseases, conditions, and medications may lead to a deficiency of one or more electrolytes and to an imbalance among them; for example, certain diuretics and a low-sodium diet prescribed in hypertension may cause hypokalemic shock as a result of a loss of potassium. Diarrhea may cause a loss of many electrolytes, leading to hypovolemia and shock, especially in infants. Careful and regular monitoring of electrolytes and IV replacement of fluid and electrolytes are aspects of acute care in many illnesses. electrolytic, adj. Any compound that, in solution, conducts electricity and is decomposed (electrolyzed) by it; an ionizable substance in solution. Any substance which, when dissolved in water, separates into pairs of particles (ions) of opposite charge. For example, sodium chloride (common salt) when dissolved in water forms positive ions of sodium and negative ions of chloride. The electrolytes include salts, acids, alkalis and metal oxides. An ion, or weakly charged element, that conducts reactions and signals in the body. Examples of electrolytes are sodium and potassium ions. Any compound that, in solution, conducts electricity and is decomposed (electrolyzed) by it. n a solution that conducts electricity by means of its ions. n the attraction of the electrolytes in the body to the different fluid compartments of the intracellular and extracellular environments. Sodium is the predominant cation in the extracellular fluid; potassium is the predominant cation within the cells; chlorine and bicarbonate are the predominant anions in the plasma and interstitial fluids; and phosphates and proteins are the main anions in the cells. n See fluid and electrolyte balance. a chemical substance which, when dissolved in water or melted, dissociates into electrically charged particles (ions), and thus is capable of conducting an electric current. 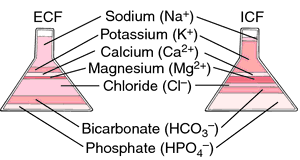 The principal positively charged ions in the body fluids (cations) are sodium (Na+), potassium (K+), calcium (Ca2+), and magnesium (Mg2+). The most important negatively charged ions (anions) are chloride (Cl−), bicarbonate (HCO3−), and phosphate (PO43−). These electrolytes are involved in metabolic activities and are essential to the normal function of all cells. Concentration gradients of sodium and potassium across the cell membrane produce the membrane potential and provide the means by which electrochemical impulses are transmitted in nerve and muscle fibers. The concentration of the various electrolytes in body fluids is maintained within a narrow range. However, the optimal concentrations differ in the extracellular fluid and intracellular fluid. An electrolyte imbalance exists when the serum concentration of an electrolyte is either too high or too low. Stability of the electrolyte balance depends on adequate intake of water and the electrolytes, and on homeostatic mechanisms within the body that regulate the absorption, distribution and excretion of water and its dissolved particles. The effects of an electrolyte imbalance are not isolated to a particular organ or system. In general, however, imbalances in calcium concentrations affect the bones, kidney and gastrointestinal tract. Calcium also influences the permeability of cell membranes and thereby regulates neuromuscular activity. sodium affects the osmolality of blood and therefore influences blood volume and pressure and the retention or loss of interstitial fluid. potassium affects muscular activities, notably those of the heart, intestines and respiratory tract, and also affects neural stimulation of the skeletal muscles. include hyper- and hypo-potassemia, natremia, phosphatemia, calcemia, chloremia. balance between fluid and electrolytes. maintenance of the osmotic pressure of the blood and tissue fluids by the maintenance of a proper balance between the normal electrolytes in the fluid, and at the same time maintaining adequate concentrations of calcium and magnesium and the proper acid-base balance. The osmolarity of electrolyte solutions influences how effectively their water and electrolyte contents are absorbed by the intestine, which, in turn, will affect the level of volemic expansion. Going forward, Toyota will observe the behavior of Li-ions caused by differences in the materials and structures of cathodes, anodes, separators, and electrolytes, as well as the differences in battery control. Frequency and significance of electrolyte abnormalities in pneumonia. This produces a crosslinked nanoparticle-polymer composite that is then soaked in a conventional liquid electrolyte comprising a lithium salt dissolved in propylene carbonate. Here t is the thickness of the electrolyte samples and A is the electrode-electrolyte contact area. This cooperative chemistry, enabled by the use of an ORNL-developed solid electrolyte, delivers an extra boost to the battery's capacity and extends the lifespan of the device. With regard to covering and throwing power the electrolyte is clearly superior to conventional chrome electrolytes basis on chromic(VI) acid. The Eagle Eye line of electrolyte level sensors has received ETL approval, designating that the device complies with North American electrical, gas and other safety standards. Trace Minerals Research (TMR), Ogden, UT, provider of trace mineral-based supplements, has added Natural Rest Plus+ to its line of stress and sleep aid products, and a new Acai Berry flavor to its line of Electrolyte Stamina Power Paks.